Vivid cultural experiences with the Hadzabe, this is not just a walking safari, this is hunting, foraging and interacting with one of Africa’s last remaining hunter-gatherer tribes. African Environments has a long standing relationship with a group of fascinating Hadzabe people who live close to the banks of Lake Eyasi. Whether coming from another adventure or from Arusha, this itinerary starts by leaving the main road at Karatu, a town on the outskirts of the Ngorongoro Conservation Area. Driving on a dirt track that drops slowly down towards the shore of Lake Eyasi, initially passing through coffee farms and arable land, closer to the lake the climate is drier and the land becomes more open scrubland. Passing through a few villages of thatched mud huts you reach the area that the Hadzabe tribe use on the border of the Ngorongoro Conservation Area. 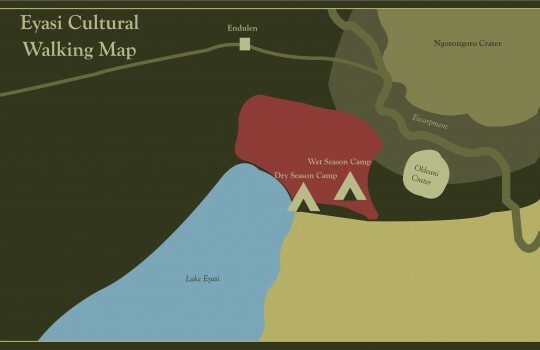 The camp crew will have gone on ahead of you, found the nomadic Hadza Camp, and set up your lightweight camp nearby. Having settled into camp you will walk across to meet the Hadza for the first time. They have no set schedule to their day so you will have the chance to join in with whatever is happening before returning to your lightweight camp for the night. An early start for those who want to join the Hadza on one of their hunting expeditions. They leave just after dawn and depending on the luck of the hunters and the abundance of game can last from one to four hours and cover up to 10km. Your guide will be with you throughout and if you feel you have had enough he can lead you back to camp. 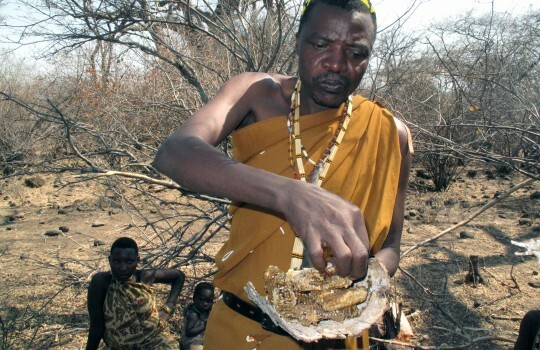 Following a successful hunt the Hadza will cook and eat their kill and they will be happy to share this with you if you would like. The remainder of the day will be spent with the tribe. This could involve collecting tubers and edible berries, learning about the medicinal uses for plants, including the ones they use to make the poison to bring down bigger game. Perhaps you will go on an expedition following the honey guide bird to collect honey from a wild hive or make more arrows (a seemingly endless task as arrows get lost on the hunt) or maybe visit the special tree where the bow wood is sourced. Having made arrows you could try your hand at archery and see how incredibly hard the bows are to draw …and the target is to hit! As the evening draws in the Hadza will often start dancing and always welcome anyone who wants to join in. Finally back to the camp for the night. Another early start for those who would like to go on the hunt again. Alternatively, go back and join the rest of the tribe in their encampment to learn more about their daily routines and traditions. 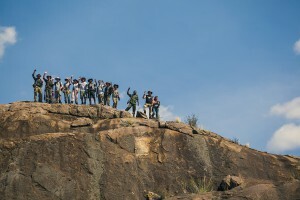 There is always something going on or something new to see, such as a hike over to the ‘birthing tree’ a huge hollowed out baobab where the Hadza women give birth.,. Saying farewell to the Hadza drive on across the lowlands at the head of the vast soda lake to reach the foot of the rift escarpment. Here a very steep road leads up the escarpment on onto the edge of the Serengeti plains. Driving higher still into the Ngorongoro Highlands and the cooler air to the Seasonal Camp for the night. Four incredible days to explore the vast ‘Wilderness Zones’ of the Serengeti National Park. These reserves within a reserve have seen virtually no humans for the past 50 years. Whilst on the walk you will not see another soul apart from your guide and camp crew. African Environments is one of only a few companies given permission to walk in this designated area of the Serengeti National Park. 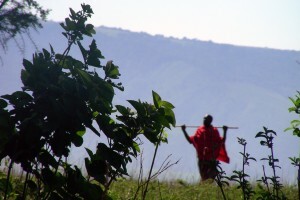 Walking with your local Maasai guide, hiking through the hills and plains of Maasai country you will get to know this ancient culture well, perhaps bumping into local herdsmen along your way or the many animals that cohabitate with them within the Ngorongoro Conservation Area. Take a different view of the animals from up high in a hot air balloon, an additional activity available on any Serengeti safari.